5 Bedroom Detached House For Sale in Stockton-on-Tees for Asking Price £450,000. 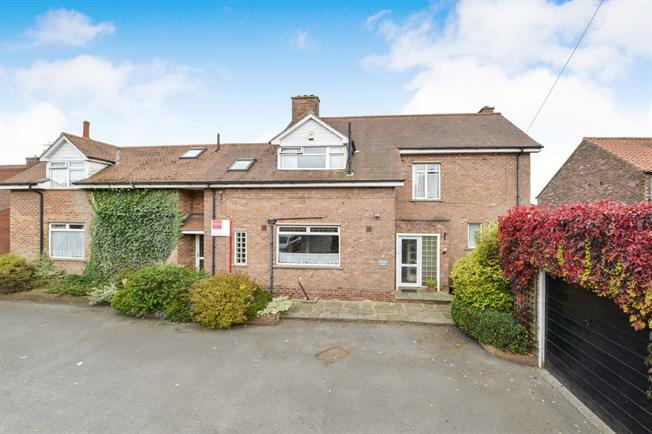 This charming home has fantastic living space for a growing family, and subject to planning, could be re configured to provide a separate annex if required. With generous sized rooms on three floors, and delightful private gardens to the rear. This is one home that really needs to be viewed to fully appreciate all it has to offer. Double glazed entrance door with side glass panel. Tiled flooring. Internal door into the entrance hall. Ceiling light. A well proportioned hall, featuring parquet flooring and attractive oak staircase and banister rail. Radiator. Under stairs storage cupboard. A delightfully light room, with floor to ceiling windows and sliding doors to the rear leading out onto the balcony, and offering lovely garden views. Open fireplace set into a standstone effect surround and hearth. Radiator and parquet flooring. A light and bright room with windows to the side and rear. Tiled fire surround and hearth with wooden mantle housing an open fireplace. Two wall lights. Radiator and parquet flooring. Comprising of a wash hand basin and low level WC. Frosted window to the front. Ceiling light. Coat rail. Featuring a range of wood wall and base units with granite and Iroko work tops. Integrated Aga and separate induction hob, with fully integrated fridge, freezer, dishwasher and plumbing for washing machine. Butler sink. Spotlights, wall mounted radiator. Part tiled walls. Dining area with space for large dining table, with built in bench seating. Quarry tiled floor. Two windows to the front. With sliding door from the kitchen. Numerous wall shelves. Window to the side, tiled floor and ceiling light. Built in storage cupboard and cupboard housing the central heating boiler. Doors to the front and the rear. Radiator. Wall mounted wash hand basin and WC. Fully tiled walls. Ceiling light. Window to the side. An extremely spacious room, with views of the rear gardens. Two full length windows and sliding door to the rear leading onto the balcony, two windows to the side and one to the front. Open fireplace. Radiator. A fantastic space running the width of the house to the rear, offering views of the gardens and fields beyond. An ideal space for outside entertaining and dining, or just relaxing and enjoying the views. With metal railings and steps leading down to the garden. Entrance to the basement rooms, with wall lights. Radiator. A fabulous sized room, currently used as a games room with bar counter. Four windows to the rear and external door to the side leading into the garden. Wall lights and two radiators. Huge potential for a number of uses. A flexible space, with wall shelves, power and ceiling light. Could be converted for a number of uses if more space is required. Range of wall shelves. Internal door from the games room and external door to the side leading into the garden. Ceiling light. Double glazed windows to the rear and door to the side. A wonderfully light room with windows to the front and rear, with lovely far reaching views. Ceiling light and radiator. Coloured suite comprising of a panelled bath, sink set into vanity unit and WC. Heated towel rail and radiator. Fully tiled walls. Sky light window. Two windows to the rear with far reaching views over fields. Radiator and ceiling light. Window to the rear with open views. Fitted shelves and desk Radiator and ceiling light. Window to the rear with far reaching views. Radiator and ceiling light. Window to the side. Ceiling light and radiator. With a range of shelves, radiator and ceiling light. Window to the side. Coloured suite comprising of a panelled bath, step in shower cubicle, pedestal sink and WC. Part tiled walls, radiator. Window to the front. Offering access to all first floor rooms. Radiator. The delightful terraced rear garden is set on two levels, with steps leading down. Mainly laid to lawn, with a variety of mature trees and shrubs including several fruit trees providing colour and interest throughout the year. A pond adds interest and attracts wildlife. There is also space for a pop up swimming pool. To the front is a small gravelled garden, with raised flower beds and parking for three vehicles. There is gated access from the front round the side to the rear garden and to the balcony. With two doors to the front, and windows to either side. With power, lights and fitted work benches. A handy store room, with access from the balcony containing the oil tank.